An app store or app marketplace is a type of digital distribution platform for mobile and desktop apps. The number of mobile app downloads expected to continue to grow. Over 178 billion apps were downloaded in 2017 and experts project close to 260 billion downloads in 2022. Apps are usually run in specific devices and written for a specific operating system. Considering Android and Apple’s iOS are the two leading operating system for mobiles, it is no surprise that the two largest global platforms for app distribution are the Apple App Store and Google Play, the official app store for the Android OS. Between the two apps stores, over 50 billion apps were downloaded in the first half of 2018 alone. In terms of content volume, Google Play is the largest app store. The number of apps available on Google Play has been constantly increasing since the release of the platform in 2008, jumping from 16 thousand in the end of 2009 to one million apps available in mid-2013. In 2018, there were 2.6 million apps available on the store. About 70 percent of the apps available on Google Play Store are free. Nonetheless, Google's digital content and app platform generates billion of dollars in revenue each year from sales of apps and games. 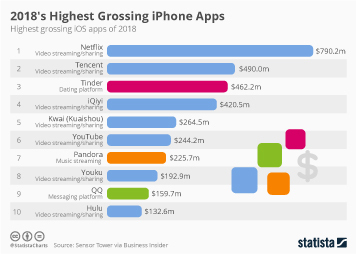 Apple's App Store is the second largest app store. As of the second quarter of 2018, the store had 2 million mobile apps available for download, up from 800 thousand in January 2013. Apple had one million native apps designed for the iPad on its App Store as of March 2016. Games are by far the most popular category on Apple's App Store, accounting for about a quarter of all apps available on the platform. Business, education, lifestyle and entertainment are also popular categories in terms of availability of apps. In June 2017, Apple announced that 180 billion apps had been downloaded from its App Store. Other prominent app stores include the Amazon Appstore, Microsoft Store, and the soon to be shut down BlackBerry World, to name a few. The Amazon Appstore, available for both Android and BlackBerry 10 operating system, was launched in 2011 and has been constantly growing since. The number of available apps in the Amazon Appstore increased from just fewer than four thousand in March 2011 to 432,900 in the second quarter of 2018.